I totally identify with that statement. I love going to another place and experiencing how suddenly, magically, everything is new and different – to me – and yet it is part of the regular scenery to everyone else. I love going on an adventure and taking pictures of the seemingly mundane: police cars, grocery store signs, little things that can get lost in – and yet completely make up – the environment they belong to. The one thing I don’t like about travel, is the hassle of all the logistical details; flight numbers, confirmation codes, and addresses – while important – are such a pain to keep straight! My mom has a great habit of printing these details out and bringing a transparent plastic file folder with important documents in it when we travel together. Fantastic – only when I try to do this, I keep putting the folder away right before I need it, or end up putting it in the bag that went in the trunk, when I need the address to the next place. Ha! Well today, I found TripIt. 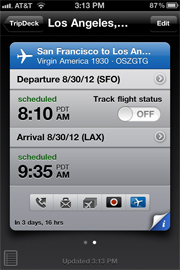 An AWESOME site (and mobile app) that keeps all your travel info together so you don’t have to worry about where you put that darn folder. 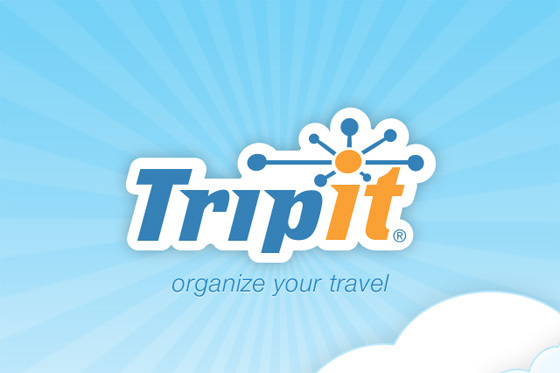 TripIt keeps track of your itinerary information, allows you to add and share details about your trip (great for when you need someone to pick you up from the airport), and lots of other cool stuff. It was super easy to create an account; I did it all on my phone. 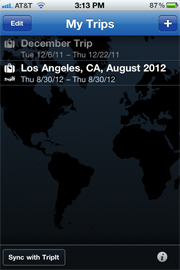 One of the coolest things about TripIt is how you add pieces of your itinerary to your account. 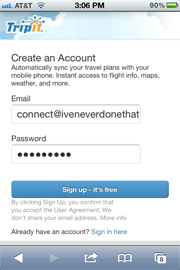 You just forward your email confirmations (flight/hotel/car, whatever!) 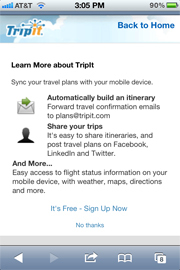 to plans@tripit.com … and they do the rest. SO COOL. 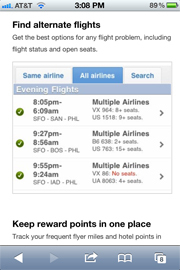 While TripIt is free, you can also pay for their “Pro” service, which lets you track your flights, find alternates if you need to, monitor all your rewards accounts, and even get flight refunds if you ever qualify. If I traveled more, I’d probably sign up – super handy, very neat. 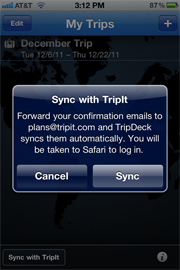 I found the free app TripDeck last year and used it a bit for our epic 2011 INDT trip, manually entering everything, and I found it really useful. And glory of glories … TripIt is compatible with TripDeck, too! 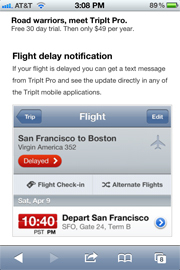 All you have to do is hit that “sync with TripIt” button, confirm the sync, and your new TripIt itinerary information shows up. This is SO exciting for an info nerd like myself! 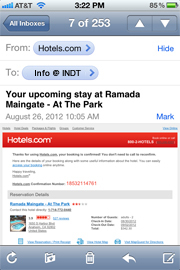 Yes … there’s an INDT 2012 trip coming up soon, as well! 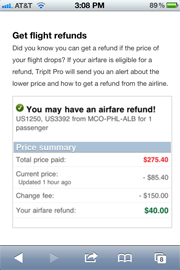 Initially, I had only forwarded my flight information to TripIt; when I clicked on that part of the trip, my flight details came up. Neat! Then I went into my email, forwarded my hotel info, and bam! 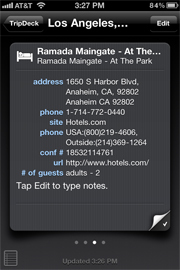 My reservation for the Ramada was in my TripDeck! Sweet! 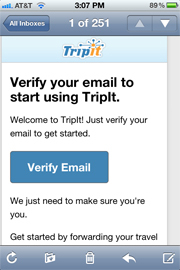 Like I said before, TripIt is AWESOME. 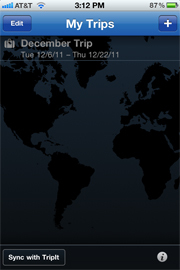 I’ll be using this for all my upcoming travel – this is so great for my peace of mind. Ah, technology!